Canadian Cyclist writer Emil van Dijk, who is also a Masters level racer, had the opportunity recently to experience first hand the Sports Health resources offered by Cleveland Clinic Canada. Whether you're a recreational or professional cyclist, or somewhere in between, chances are that you have an interest in improving your cycling experience. Whether you are embarking on a training program, looking to get fitter, or hoping to determine how effective your current program is, one of the most important things you can do is get some unbiased and professional feedback. Top level athletes have ongoing access to resources such as sports physiologists and nutritionists, but anyone can benefit from tapping into this expertise. One such resource is Cleveland Clinic Canada in Toronto, which now offers access to knowledge and testing procedures generally reserved for professional or national team athletes. A division of the Cleveland Clinic, a highly regarded academic medical centre with facilities in the United States and abroad, Cleveland Clinic Canada has been offering outpatient services in downtown Toronto since 2006. Its primary objectives are preventing disease and enhancing overall health. To meet these goals it offers a number of programs and services, one of which is a sports health program designed to assist athletes with performance maximization and injury prevention. Thanks to a connection made through custom bike-builder Vitess, with whom it shares a lifestyle vision, I was invited to experience first-hand what Cleveland Clinic Canada can offer the cycling community. Prior to visiting, I was asked to complete a number of forms that would allow the wellness consultants a better sense of who they were dealing with. Topics covered included a three-day diet record, medical history, body measurements, physical activity and sporting goals. The first item on my agenda was a consultation with registered dietitian and sports nutritionist Nicole Springle. Having received my diet record a few days earlier, she had already entered the minutiae of my food consumption into her computer. Thanks to sophisticated software, a detailed dietary analysis was just a mouse click away. When working with clients, Nicole stresses education and opportunities for improvement. Before looking into the nuts and bolts of my eating habits, she asked for my thoughts and observations. By maintaining a diet record, I had already gained a better appreciation of my food intake, and freely admitted what I thought were deficiencies in my nourishment practices. The main issue that I had noticed was a craving for snacks in the evening. Nicole pointed out that while I was meeting my total energy requirements, my timing was off. I wasn't getting quite enough energy during the day, and was playing catch up by snacking after supper. Since my breakfast, lunches and dinners were already adequate, she suggested bumping up my mid-morning and afternoon snacks to avoid the evening cravings. The diet analysis showed that while I was generally doing a good job, there were a few areas that needed improvement. My Vitamin A, Folate and Vitamin K levels were on the low side of optimum, so again Nicole offered some suggestions. Orange vegetables and fruits are sources of Vitamin A, while Folate and Vitamin K are found in dark green leafy vegetables. Since I already needed to snack a bit more, a mid-afternoon helping of raw carrots with sweet potato hummus would bump up my Vitamin A.
Cleveland Clinic Canada also offers Resting Metabolic Rate testing. This 15-minute non-invasive test calculates the amount of energy needed to operate your body's systems when you are at rest. Proper protocol requires the test to be performed on an empty stomach. If that isn't always possible for logistical reasons, RMR can still be estimated based on height and weight. Combining the RMR and caloric needs based upon your activity levels can provide a precise picture of body's energy requirements, ensuring optimal fueling. "What I do is translate science into actual food for people," explains Nicole. "Whenever I work with athletes that's the most important thing, because nobody eats carbohydrates, proteins and fat; they eat food." Following my nutrition session, I met with exercise physiologist James Manson for the administration of both a VO2 Max test and some functional strength tests. I was a bit nervous because I had never experienced a VO2 Max test, but was aware of stories of people going beyond the point of exhaustion and passing out. Typically performed on either a stationary bike or a treadmill, a VO2 Max test (V stands for Volume, O2 for Oxygen, and Max for Maximum) measures one's maximal oxygen uptake. It is considered the prime indicator of aerobic fitness and cardio-respiratory endurance. When trying to determine if a Junior hockey player has what it takes to play professionally, NHL scouts leave no stone unturned. In those instances, James will have clients perform the VO2 Max test to the point of exhaustion. Many patients, however, would not be well served by a test that takes them to their upper limit. In fact, it isn't required. The measuring system provides a functional peak, and embedded formulas indicate a predicted maximum. The better a patient's condition, the closer the peak and the max will be. Before commencing the test, James checked my blood pressure and pre-exercise heart rate. Satisfied that I would likely survive, he allowed me a brief warm-up while he affixed the oxygen-collection mask and calibrated the system. A lengthy warm-up can deplete muscle glycogen, which may lead to a lower maximum, so only three to four minutes of warm-up preceded the test. Once underway, my job was to keep pedaling at a consistent 80 to 90 rpm. Starting at a comfortable setting, James would incrementally increase the resistance every two minutes, until my rate of perceived exertion reached eight or nine out of ten. The opening stages were easy, but it gradually became very difficult. All in all, it was much like riding a time trial, but much shorter in duration. "For someone who exercises and trains, these kinds of tests are nothing," says James. "It's hard on people who don't do anything and to get a max number out of them is hard." Once I had recovered, it was time to check my range of motion, take some critical body measurements, and perform a number of functional strength tests. These latter tests consisted of pushing and pulling as hard as possible (with a gauge) against a fixed object, squeezing a grip strength dynamometer with each hand, and a near-maximal leg press. When all the testing was complete, we sat down to have a look at what the numbers had to say. For James, performance is built on the basis of good health. "I always look at health-related fitness. Everything has to support health-related fitness and then I add on top of that. You can be healthy and have good performance-related fitness. If you compromise health, you're going to compromise performance as well because that's the foundation beneath that." According to the data, I was in good health. My VO2 Max was better than normal, but my Body Mass Index, although within the healthy range, was on the low side. James pointed out that research indicates that men with a higher amount of muscle mass have a better quality of life as they age. Since I am on the slim side, he suggested that over the course of the next decade I try to increase my muscle mass. Doing so would benefit my health, and would also improve my physical performance. Shortly after my visit I received messages from both Nicole and James. These included both a review of our discussions as well as results of the various tests. Furthermore, they included significant amounts of material to allow me to move forward on my own. "We believe in giving our patients the tools they need so they can implement the information in a way that works for them and their lifestyle and schedule," states James. From Nicole I received a number of recipes and a long list of snack ideas, as well as nutritional resources related to vitamins and minerals. James sent me a 22-page document with plenty of suggestions for cardiovascular, musculoskeletal and core training. He also included heart-rate training zones based on my test scores. There are times when you can't see the forest for the trees, and it helps to have a different set of eyes to show you where to look. The tweaks I've already made to my diet thanks to Nicole's input seem simple in retrospect, but I'm not sure I would have figured them out on my own. Since I want to enjoy my future to its fullest, I will implement James' suggestion about adding muscle mass. The training ideas he passed along are not unlike what I'm already doing, but I'm going to try them and see what comes of it. The VO2 Max test was interesting in that I could see how I compare to the general population, but just having a good number isn't going to win you any medals. Even world champions have to keep training. 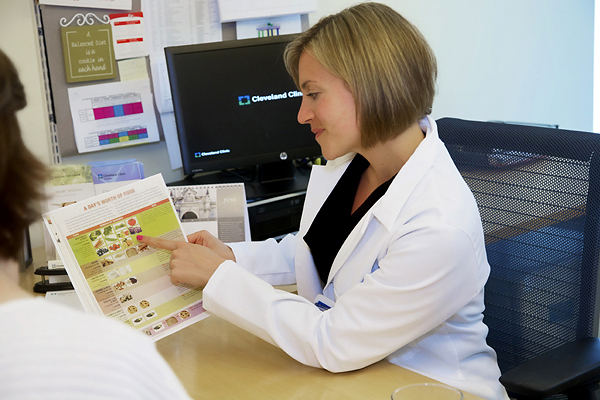 Being able to discuss my dietary and physical shortcomings with people who are experts in their field, and to hear their ideas for improvement was, for me, the most valuable part of my visit to Cleveland Clinic Canada. A nutrition consultation costs $175 (a follow-up session, if needed, is $90), and a VO2 Max test and accompanying consultation with an exercise physiologist costs $295. At these prices you're not going to drop in on a weekly basis, but even if you only go once, it could be money well spent.